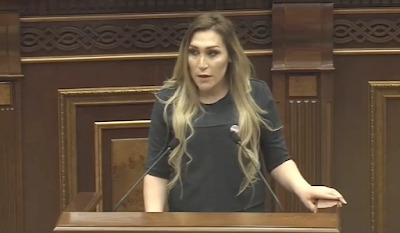 History was made in Armenia on Friday 5 April 2019, when during parliamentary hearings on the UN UPR (Universal Periodic Review - the process of a review of the human rights records of UN member states), for the first time ever, transgender woman Lilit Martirosyan, head of Right Side NGO, addressed MPs, members of Armenian civil society about the state of trans people in the country. It was a powerful speech, right to the point, very well delivered. As subsequent reactions on Armenian FB and media illustrated, such level of visibility shocked the system. Instead of discussing the content of her speech, the main talking point on FB was the very fact that transgender woman was ‘allowed’ to enter and deliver speech in the parliament. Parliamentary human rights committee chair Naira Zohrabyan of BHK party was ‘outraged’ by Lilit’s speech, citing ‘agenda hijacking’. She described Lilit’s speech “disrespectful” towards her personally, towards human rights committee and the parliament. Number of activists left the hearings as a protest re Naira Zohrabyan reaction. What kind of ‘agenda’ you are talking about, MP Zohrabyan? Agenda that includes only convenient for you and your party topics? Agenda that excludes LGBT people from human rights discussions? If this is the agenda you are referring to, then it only deserves being ‘hijacked’. To remind, Naira Zohrabyan became chair of human rights committee in the Armenian parliament solely as part of their party’s quota. She (and the party she represents) has no comprehension of the notion of human rights whatsoever and should be challenged constantly. They are so at odds with the ideals of the Velvet Revolution. To complete the picture, suffice to say that following the hearings there were death threats on Armenian FB against Lilit Martirosyan, LGBT rights activists and… flowers for Naira Zohrabyan. But hey, back to the positive news, well done Lilit !! Big respects !! Below is a full transcript in English of Lilit’s speech, and video (English captions). We are making history today. Even a few months ago, it was impossible to even imagine what is today a reality in the post-Revolution Armenia. 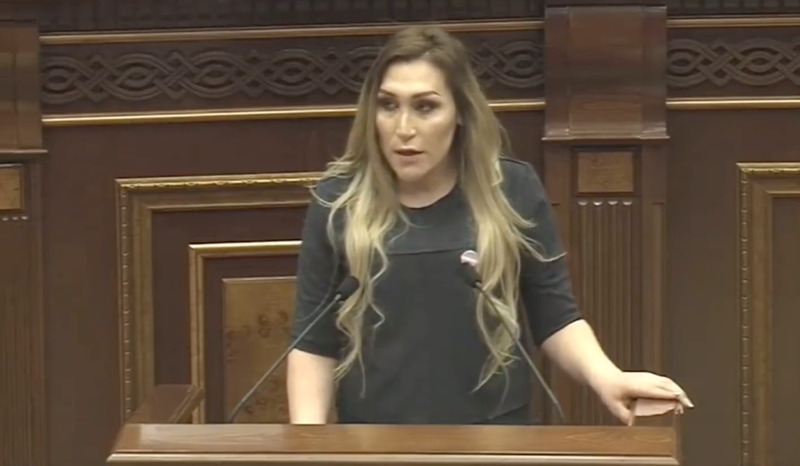 I am delivering this speech to you from Armenian parliament podium, as a transgender woman. But I ask you to see me as a collective figure. Being a member of the Armenian transgender community, and the president of the Right Side human rights NGO, I encompass in myself tortured, raped, kidnapped, subjected to physical violence, burned, immolated, knifed, subjected to murder attempt, killed, emigrated, robbed, subjected to stigma and discrimination in social, medical, legal, economic areas and in every aspect of a dignified life, unemployed, poor and morally abandoned, Armenian transgender’s image. Up until 2018, we have registered 283 similar cases against transgender people, and I don’t know what is scarier - this number or the fact that only a minor part of these cases were registered by the police or by other competent bodies? And if you take the above number “283” as the number of transgender people in Armenia, whose rights were violated, then, for me, it means that there are 283 criminals living next to me and you. And who knows, maybe the 284th will commit their crime just tomorrow. What is also concerning is that people who defend transgender people are also subjected to physical violence and persecution. In just one month, some people had cut the throat of a transgender person and have violently beaten the other one in their own apartment. And completely burned down the apartment including their personal belongings. Think about this, gentlemen. I call upon you, including the representatives of transgender people, to get involved in the implementation of policies and legislative reforms related to gender equality and ensuring human rights in general. And we are ready to support you in building democracy in our homeland.